This is an unprepossessing restaurant in Market Row which competes with Prima Donna and Provincial on the opposite side of the alleyway. It goes in for small plastic tablecloth coated tables inside or outside the restaurant with plastic chairs (outside) or plastic stools (inside) and a variety of leftover silver decorations from the Chinese New Year or Xmas. It started off in the early days of the transformation of Brixton market as just a small stall offering takeaways, but it has grown over the years, taking over adjoining units. 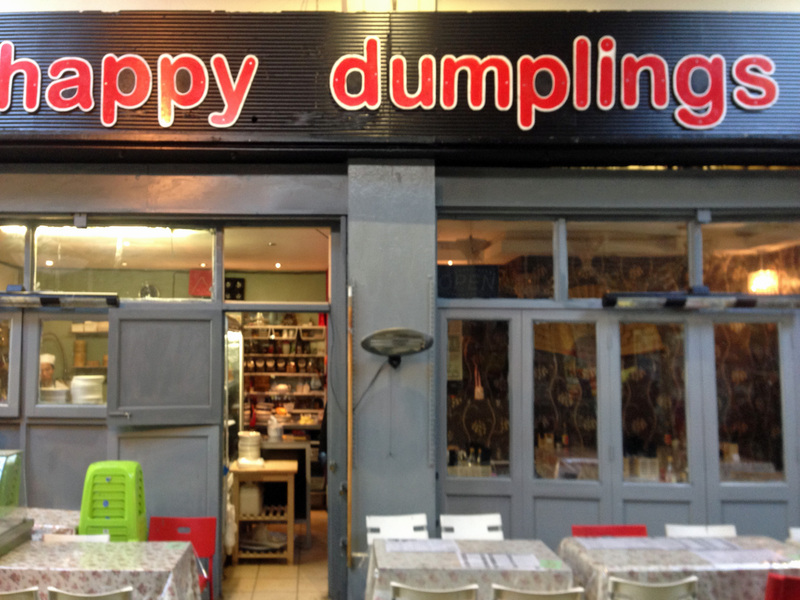 Between us we’ve eaten there a few times but have never felt it lived up to it’s promise – Brixton could do with a really good mainstream Chinese restaurant. But now it does look like a proper sit down restaurant and often seems to be crowded, so we decided we had to give it another go. In the event, we don’t think the other restaurants have much to worry about in terms of competition. The plastic coated menu has a dauntingly long list of potential dishes which incorporates both dumpling, dim sum, Japanese and Thai dishes and the usual Chinese delicacies such as ribs and fried seaweed (although in the event they didn’t have any seaweed). 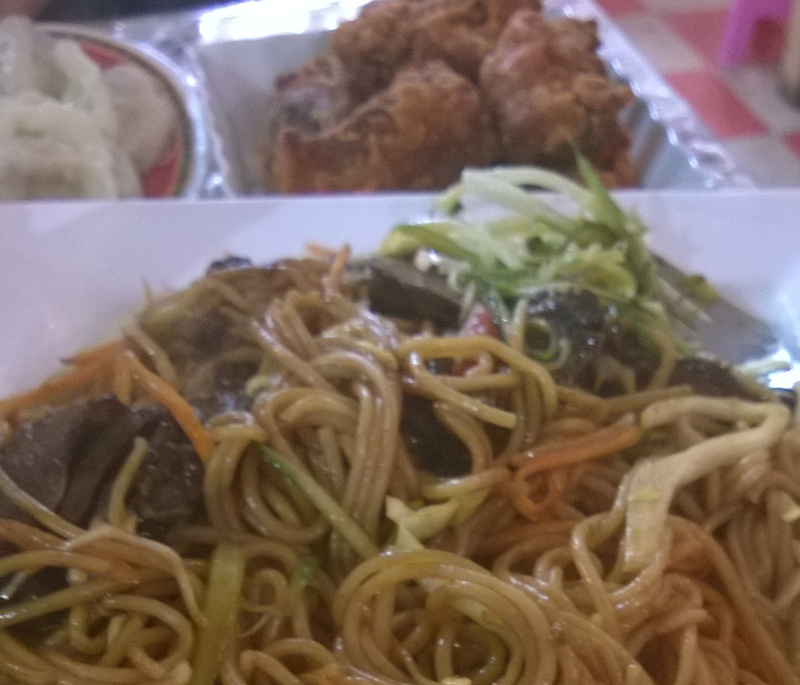 Even the Chinese dishes come from different parts of China. We chose Guilin noodles with beef, pork ribs, pork and spring onion steamed dumplings and sticky rice (this never arrived which was really good thing as we seriously over-ordered). The ribs were a rather unusual colour – more pink and the coating was crunchy – quite like Kentucky Fried chicken. The plentiful noodles tasted of the 5-spice (but not much else) and the steamed dumplings looked lovely but were very salty. We washed this all down with a large bottle of Tsingtao beer. The bill came to £27.50 in total and the waitress was keen to wrap up all the leftover food, which could easily have served two more people, but we politely declined. We can’t recommend this restaurant. I am bemused at the often full tables at this place, and cannot for the life of me understand why it’s still going strong. I’ve been here once and could not stomach another visit. The dim sum had an unnoticeable variation in flavor (despite ordering pork, prawn beef and veg) with perhaps only a slight variation in texture. You could taste the rancid flavor of the oil through the food. This was on top of really poor service where we were left waiting for over an hour for the food, drinks had to be asked for twice, items ordered never arrived etc etc. The place was also filthy. I notice lots of other bad reviews – only wish I’d read them beforehand. Agree with the above in that this place cannot be recommended.